I've been hard at work on a couple of new projects recently, and spending hours hunched over keyboard, Wacom pad and mouse have perhaps made me over-sensitive to bad ergonomics. 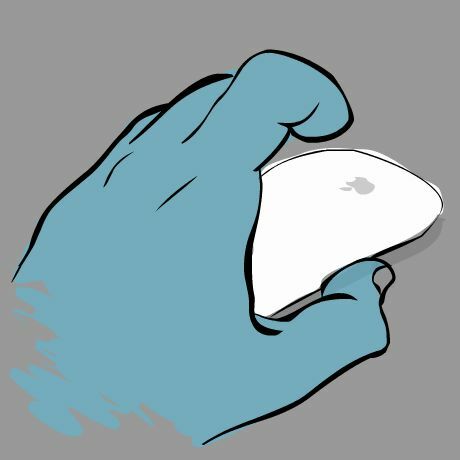 Take the Apple Magic Mouse. It's wireless, and the surface is one big trackpad. That's good. It's very accurate and works on any surface - also good. But reach for it while staring at the screen, after using another input device like a Wacom pen, and you realise there's no tactile feedback on its orientation. There is no physical way of determining whether you're pointing it in the right direction at all - and precious little visual feedback either. A small grey apple logo on a white surface of an otherwise rotationally and reflectively symmetrical object is not much use in a dark room!